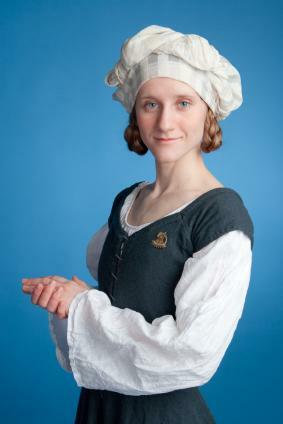 It is easy to find patterns for making basic medieval clothing. Thanks to diligent artists, designers, historians and the Society for Creative Anachronism, it is very easy to obtain quality and accurate medieval costume patterns. From the peasantry to the royals, you can make whatever sort of garb suits your needs or appeals to your old world fancy. There are three main options to choose from when scouting for medieval costume patterns. You can go with something from one of the main pattern companies, such as Simplicity, McCalls or Butterick. These patterns will be inexpensive and easy to work with, but, because they are commercial, they are less likely to be historically accurate. If you are making a costume for Halloween or a party, however, this can be a good and simple choice. Simplicity 2573 are patterns for traditional dress, belt and veils for sizes ranges 8 to 22. Simplicity 2589 offers a popular Tudor style dress for sizes 8 to 24. Simplicity 3623 takes your costume choices north to Scotland where renaissance dress is flavored with Celtic colors. 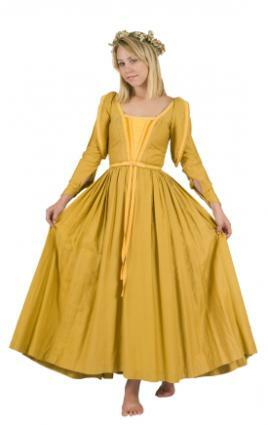 McCalls M5499 are basic misses, children's and girl's medieval costumes. Butterick B4827 is the simplest of misses designs using two standards of fabric color. If you're interested in a truly historical costume, you can opt for costumes designed by companies that specialize in reproduction patterns, such as Folkwear (although these are best used by the most experienced sewers), or patterns created by Cosplay fans or SCA members. Such patterns can usually be the best when it comes to historical accuracy. There are those who assume period authenticity is best achieved with a design for film or stage, but since such costumes are designed to look well under certain lights these are less likely to have a genuine feel. You are best off with the patterns created by those who love the clothing of the time. By the Sword offers medieval swords, clothing, armor, chainmail, leather and more. The Renaissance Store provides plenty of costumes for purchase along with patterns and accessories. Patterns of Time offers more standard, but pricier patterns, where you can either buy a catalog of patterns or browse online. They have a large selection of patterns for everything from stockings to cloaks and all manner of dress ranging from the 10th to 16th centuries through Europe. Some amateur costumers will have patterns available for free online, but many charge a small fee. It's worth it to get something good that you can work with. If you're new to medieval costuming, you should start with a general website that offers a lot of information, like The Costumer's Manifesto. In addition to patterns, there are a number of articles describing the various styles of costume, along with illustrations. You will have to choose which century you want to represent and then choose the right style outfit. For those who want to be serious about their medieval garb, invest in books or bookmark links showing period illustrations and learn about the various styles of clothing. Soon, you will master techniques for improving the look of your garb. Be sure to use natural fabrics, such as pure wool, silk and linen. There is no point in creating a historically accurate outfit, if you don't use historically true fabrics.